And she’s right, making a display like this does take a lot of time but I didn’t make this in one sitting. 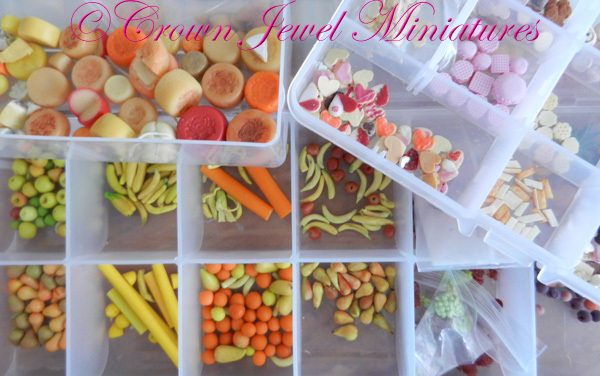 Most of my time is spent fulfilling custom orders and when I make mini food I always make extras to maximize my time. It’s also a safety net in the event one gets ruined. I store the extras in airtight bins and eventually my stock builds up and I’m left with several loaves of bread or salami, fruit, cookies, cupcakes, cheeses- you name it. 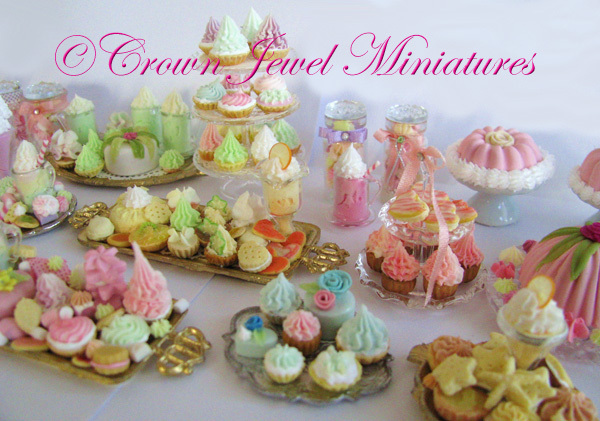 These extras really come in handy when I’m gathering minis to create a preparation board or busy tabletop scene but lately I’ve been grouping them together to pare down my stock and that’s the inspiration behind my most recent art, such as the Marie Antoinette dessert collection and the salami board. Having extras in stock is a great way to create truly OOAK pieces because I work from my imagination- I don’t keep clay color recipes- I mix clay in small batches and no two batches are ever alike. This ensures variety and opportunity to experiment with color mixes and new add-ins. 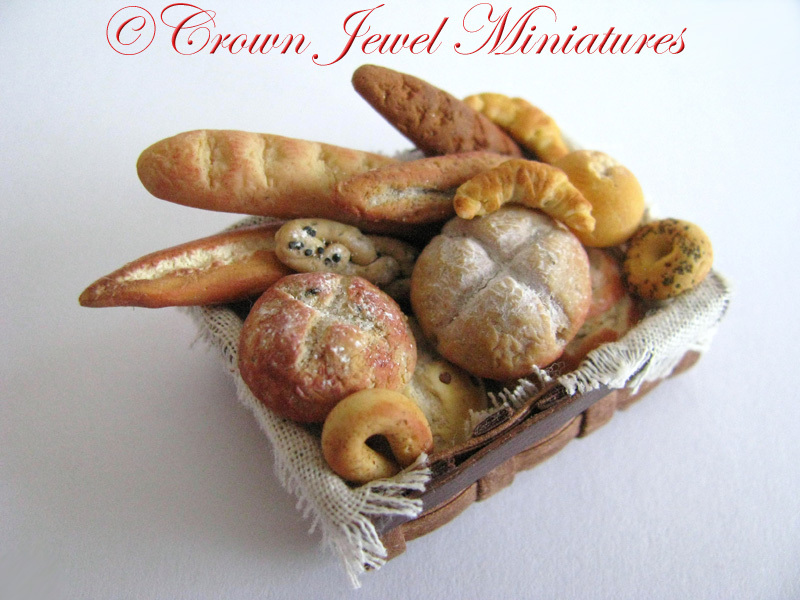 The apples or French breads I made last month won’t be identical in color to the ones I make next time around. As an artist, I need that level of creativity and keeping notes or color charts would deprive me of that. Thanks for the question Ramona! If I had to recreate the salami board from scratch it would take about a week or so! Happy mini making, mini friends!! 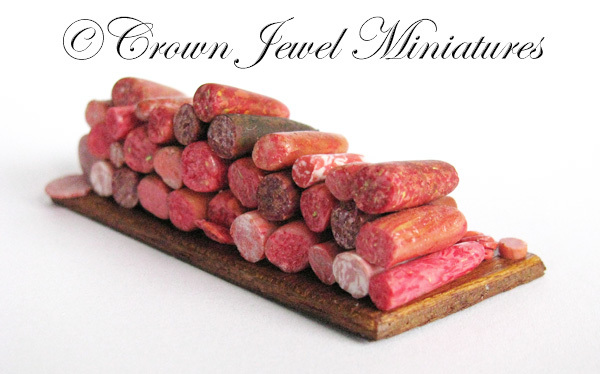 ©Copyright 2014 Crown Jewel Miniatures. All rights reserved. This entry was posted in Crown Jewel Imaginarium. Bookmark the permalink.